and left the mess for the morning!! aaaaaaaaaaaaahahah I LOVE IT. the strips can wait! Oh yeah... Totally done that. One night that happened and I was so tired that I grabbed a used one and couldn't figure out why it wasn't working!! Same same! That can be an expensive mishap. 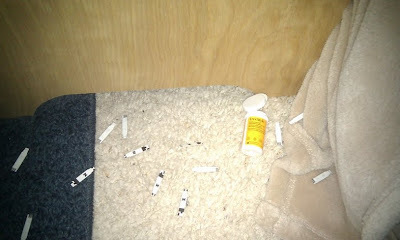 I have dropped some and gotten them mixed up with used ones (she stores the used ones in open pocket in glucometer case. All had to be thrown. You must have been exhausted. Ugh I hate when I do that!